102 page catalog to accompany the Norman Rockwell Museum's retrospective exhibition celebrating distinguished illustrator Everett Raymond Kinstler's 70-year career from a comic book and paperback artist, to esteemed painter of celebrity and presidential portraits. This catalog is filled with wonderful full color illustrations alongside essays by Martin Mahoney, William H. Gerdts, and Stephanie Haboush Plunkett, with foreword by Norman Rockwell Museum Director and CEO Laurie Norton Moffatt. Kinstler's success as a portrait artist is evident in even a cursory glance at his illustrious roster of sitters. A Who's Who of American history and culture across the 20th century, his clients have included author and illustrator Theodor Seuss Geisel (Dr. Seuss); author Tom Wolfe; Presidents Gerald Ford, Richard Nixon, Ronald Reagan, Jimmy Carter, George H.W. Bush, Bill Clinton, and George W. Bush; entertainers John Wayne, Katharine Hepburn, Paul Newman, and Tony Bennett. 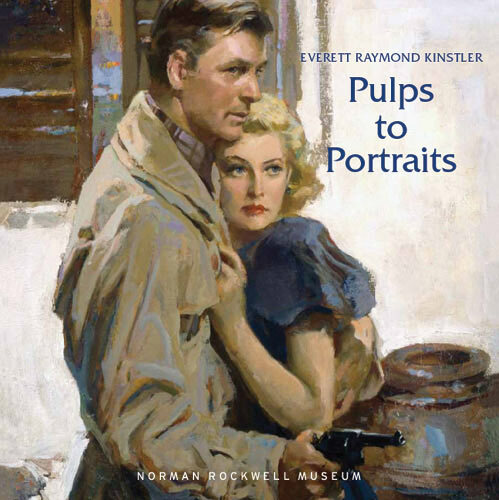 Evert Raymond Kinstler: Pulps to Portraits on display from March 10 through May 28, 2012 at Norman Rockwell Museum.